KOSCIUSKO — A Milford woman was arrested after breaking into a residence, lighting a sweatshirt on fire and battering a male subject. 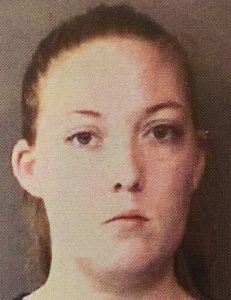 Hannah Marie Fisher, 27, 10549 N. CR 200E, Milford, is being charged with residential entry, a level 6 felony; criminal mischief, a class B misdemeanor; and battery, a class B misdemeanor. On Saturday, March 30, an officer with the Kosciusko County Sheriff’s Office responded to a report of residential entry. When the officer arrived at the scene, he spoke with a male subject who said a female, identified as Fisher, entered his home uninvited by breaking the handle off of a locked screen door. According to the affidavit of probable cause, the male went next door to report the incident to his landlord. When the male returned, Fisher had placed one of his sweatshirts in the sink and set it on fire. Fisher then attempted to take possession of the male’s cell phone. As the male tried to protect his phone, Fisher began hitting him on the face, chest and groin. During the altercation, Fisher also broke a necklace the male was wearing and took his glasses, which were located broken in the residence’s front yard. Fisher admitted to officers she went into the male’s house uninvited and hit the male. She was booked in the Kosciusko County Jail on March 30, with a $5,250 surety and cash bond.